A thief in Australia looking to steal an ATM from a gas station came away empty-handed after the robbery didn’t quite go according to plan. Police from the state of Queensland posted a video showing criminal’s misadventure – adding a theme tune. The offender arrived at the gas station in a stolen pick-up truck and seemed to be initially well-prepared for the operation. 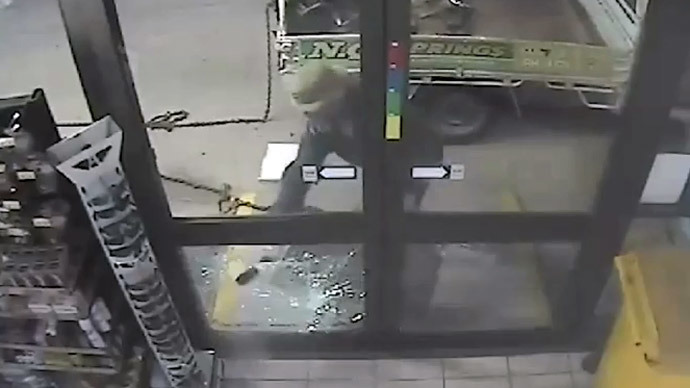 Out came a slab of concrete and a hammer to smash in the door to the store in the northern city of Townsville. The criminal also took care to ensure it would be as difficult as possible to identify (presumably) him, wearing a hat with dangling mesh to cover the face. The target was a cash machine inside and the robber released a strong metal chain attached to the back of the truck. He proceeded to drag it into the store and attach it round the ATM, with the aim of hauling it out using his vehicle. However, this is when things started to go wrong. The thief forgot to test the strength of the link holding the two chains together. When a little bit of pressure was applied the chains came apart. The robber was in such a hurry to make off with the loot that he didn’t even notice the chain had broken, despite looking straight at it. He drove off with the chain dragging idly behind the truck. After realizing that the cash machine wasn’t connected to the truck, the thief made another pass by to try and capture the elusive ATM. Once again fortune or intelligence was not on his side. The criminal drove back to the scene, but unfortunately parked too far away from the entrance to make it possible to reunite the two chains. Rather than risk a third attempt, the criminal realized that perhaps a little more intelligence and planning was necessary and made a disconsolate retreat from the scene of the crime. Police in Townsville decided to release a video of the hapless robber for the online community to have a look (and laugh) at. They even selected some appropriately ‘sneaky’ incidental music to accompany it. They have also launched an appeal to try and locate the offender, who is wanted in relation to a stolen vehicle and attempted robbery.